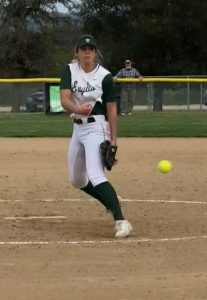 The Templeton Eagles softball team beat Righetti 7-5 yesterday. Ashley Daugherty gave up five hits and 2 earned runs. She struck out 13 Warriors. The Eagles play tomorrow afternoon against Atascadero. The Atascadero softball team beat Arroyo Grande 5-1 yesterday. Bailey Doherty gave up 3 hits, but no earned runs. She struck out 9 Eagles in the game. Yesterday, the Paso Robles softball team beat San Luis Obispo 3-2 in San Luis. They play this afternoon at St. Joseph in Santa Maria. They’ll host Arroyo Grande on Friday. In the Mountain league softball standings, the Greyhounds and Bearcats remain tied for first. Each team has a 7-conference record. The Paso Robles baseball team hosts Arroyo Grande this afternoon at 4:30. Ryan Harvel will start for the Bearcats. The Templeton Eagles baseball team travels to Santa Maria today to take on Righetti. In college baseball, the Cal Poly Mustang baseball team lost to Fresno state Tuesday night at Cal Poly 16-6.